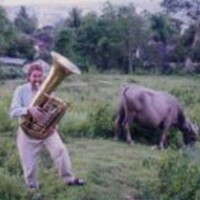 Who played the tuba? My memory is quite shoddy, but I seem to remember that it was nothing to write home about? TV speakers were bad, in this timeframe. They made it sound like he slurred a bit, and had a weak tone. Almost sounds like Tommy Johnson messing around, like the Rudolph Reindeer song. Almost a year and a half has gone by since this posting. I know it was Tommy Johnson. It was listed in one of his bio pieces for a program of a conference he was in some forty years ago I attended. One tragedy after another one. Will be leaving Needles soon and moving to the Los Angeles area. I am so sorry for anyone planning to do one of the projects in Laughlin I never got to start.